Kale is on every list for "healthiest vegetable". Many of you hate it or will never try it. But you cannot give up on kale! This is the vegetable that will solve all of your problems. Constipated? Eat kale. Want to avoid cancer? Eat kale. Overweight? Eat kale. Depressed? Eat kale. Looking for a boyfriend? well, I'm not sure about this one - but it might work! I made this video to motivate you to get your kale on. Ha!Ha! Love it. But I am reminded of the quote "One can get too familiar with vegetables you know" from the animated movie Ratatouille! I am a true fan of Kale but can not eat it raw. I have to have it cooked in some way. Raw taste gritty to me even after washing. I have embraced kale and sturdy greens as the base for almost all my meals instead of rice or pasta. its a great way to get the greens in your diet. its an adjustment of course, but the resulting meal is filling and is a nice foil to roast veg, tomato sauces warm and cold (like salsa) or simple proteins. After washing, de-stemming, and slicing very thinly, they last all week nicely in the fridge wrapped in a cloth or paper towel. the oil/lemon dressing is kept separately. toast halved almonds and also store separately. or use diced avocado, feta, even scrambled eggs as toppings. Ok, I know how great kale is BUT I just don't like it😔. Going to give it another try cause you make it look so eatable. I just can not do kale in the raw or chips but it's a great addition to shakes and soups. OMG you are just too funny!!! Thanks so much for sharing!!!!! I've always been interested in trying Kale for salads. So far I've used it for smoothies in the morning and in summer heat, but this salad looks great! Thank you for sharing! I'm going to pin this to my Pinterest board to save for later! I chop my washed kale with kitchen scissors, then add chopped celery, green onions, feta or Parmesan and any other veggies. For the dressing I also use olive oil and lemon but for the croutons I use corn nuts! So good. You are so funny! Love the video. And love kale. Must have it year round every 7-10 days, I actually crave it [or collards, chard, rabe]. Kale quick-sauteed with smidge olive oil, garlic, S/P is my fav way, served with sweet pot or winter squash and beans=perfect health food. My body feels energized, my mood elevated, just feel good all over. I usually get 3 meals for just me for $1. In between kale meals I usu. eat broccoli, cabbage, brussels, spinach, etc. These past 3 days' lunch, I topped raw spinach with marinated chickpea-celery mix, beets, grated carrots-raisins, chopped HB egg, feta. and toasted walnut-pecan mix. I just put kale on todays grocery list! I am convinced once people start a super healthy food routine, there's no going back! I think massaging kale sounds like a cool idea for winter salads. One question, how long after massaging will kale last, keep its freshness? @Barb L - it keeps for about a week - no kidding! Thanks for your comment and question! 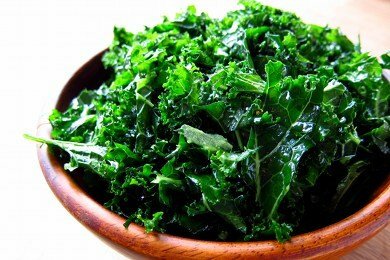 Kale is a power food and contains less oxalic acid than any other green. It is the best for your K2 vitamin too. You might even blanch the kale to soften the texture a bit. I have read that cooked kale is even more beneficial. I love kale, but have never taken the time to do a massaged kale salad. I love it in soups or steamed with a tiny bit of butter and a squeeze of lemon. Delish. Yum! Nice easy way to eat a healthy green 'salad'. Sorry, Kale always tastes bitter to me. I have tried kale chips, and they were the only way I considered it edible. I still did not like it, but could eat it. SO, I just eat spinach instead. But hey, this lovely salad will work fine with spinach. Thanks! I add kale and/or baby spinach to the vegetable medley I add to my egg white quiches that I make each week. I just add 1 TBSP EVOO to pan and then cook on medium-low heat and vegetables pretty much steam themselves soft. I recently found baby kale in the grocery store, and found it pretty good in a salad. Tuscan Kale at Trader Joe's is packaged ready to eat and seems to have a sweeter taste than Kale I've purchased in the vegetable section of the market. A raw taste test comparison when checking the potential difference. No work at all to remove from the package and place in the bowl ready to go! To you guys still scared of raw kale, do the massage thing. It will shock you. Change your life. You won't believe it. In fact, just take one leaf, slice it up, massage it up with the oil and salt, and taste it. Change your own minds. And no, kale does not attract men. I have never tried kale. However, in northeastern Massachusetts, we have had so much snow, new and fun soup recipes are in order. The recipe I chose required kale. Because I felt brave, a bought a kale & spinach mix and used that. The soup was yummy (we still have more snow on the way) and I'm no longer shying away from kale. I had this twice this week. I added avocado as well. It is really good. For easy avocado use I just cut off one end or a slice off the top, leaving the pit in, and scoop out what I want. It seems to keep it fresh for days.